Four authentic past papers from Cambridge ESOL for the Cambridge English: Key exam, also known as Key English Test (KET). 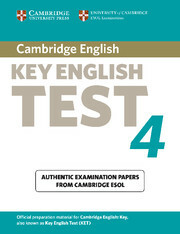 Cambridge English: Key is at CEF level A2. The Student's Book without answers contains practice material for Paper 1 (Reading and Writing) and Paper 2 (Listening), along with attractive colour visual material to enable thorough preparation for Paper 3 (Speaking). Four authentic KET past papers from University of Cambridge ESOL Examinations.